Second semester of a student's senior year is filled with much excitement! Soon, graduation day will be upon us. This thought may bring great anticipation and joy, along with some feelings of sadness too, as students begin to realize they will miss classmates and parents witness their child complete a chapter of his or her life. No matter what emotion it brings, this is a time to honor and celebrate the accomplishments of our young graduates. Commencement means a new beginning or fresh start. We wish to make the start of this new journey an extra special occasion for your family! In order for this day to run smoothly, everyone must do their part. We recommend both parents and graduating seniors read through this information carefully. Class of 2019 Commencement Rehearsal: Graduates - Be On Time! Rehearsal is mandatory! If you are not present at rehearsal, your name will not be read on graduation day. Please be prompt since we cannot begin until everyone has arrived. The sooner we begin, the sooner you will be finished. We recommend preparing for heat: sunscreen, sunglasses, hats, bottled water. Class of 2019 Commencement Ceremony: Graduates - Be On Time! By 9:30 a.m., graduates are to be lined up behind the bleachers. DO NOT BE LATE! Arrive dressed in pressed gown, cap with tassel, and any chords or pins you receive at the Awards Assembly on Friday, May 17. 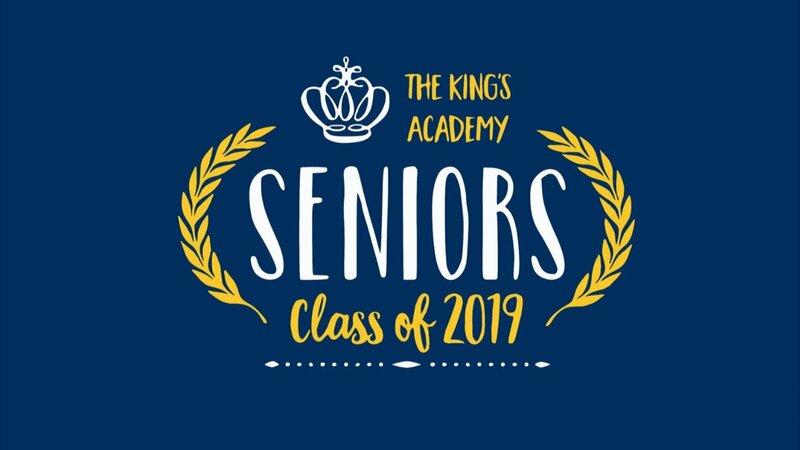 Every part of the TKA dress code is still in effect for both rehearsal and graduation and will be strictly enforced. This includes no nose piercings for girls or ear piercings for boys. We do not want to send anyone home, resulting in not being allowed to walk at graduation. Attire guidelines are still in effect for graduates' under-robe attire. If it is something a student would wear to a nice event or a wedding, then it is probably acceptable for graduation. Graduation caps may not be decorated. Please iron your graduation robe! Processional: Students may not carry anything in their hands during the processional; purses, cameras, etc., should be given to parents before the processional. Students may have sunglasses tucked underneath their robe to wear during the ceremony, but sunglasses may not be worn during the processional and when on stage. Nice dress shoes must be worn (no flip flops or sneakers). Very high heels are not recommended since students will be walking on the turf field and up stairs to the stage in order to receive their certificate. There are no required tickets for graduation, and there is no limit to the number of guests you may invite. Seating will be in chairs on the field and in the stadium bleachers. Seating will be open one hour before the start of the ceremony (9:00 a.m.) and will be on a first-come, first-served basis. We recommend preparing for heat: sunscreen, sunglasses, hats, bottled water. Umbrellas are not permitted as they obstruct the view of other guests. Two canopy sections will be available on the field for guests with special needs and the elderly who need to be seated out of the sun. One additional family member is welcome to sit with them. These are also on a first-come, first-served basis. Guests in wheelchairs, or guests with difficulty walking, can be dropped off near the Athletic Office at the front of the school. Ramps will be in place to provide easy access to the field. Handicapped parking will be available in the front parking lot near the Athletic Office. So that you are not rushed on graduation day, we recommend no earlier than 1:00 p.m. for lunch reservations or party start times. Caps and gowns will be delivered in early May. It is still possible to put in a late order online at www.highschool.heffjones.com. Prices go up after April 1. Announcements: Additional announcements can be ordered here. Video: Order online here. For your convenience, TKA hires an outside contractor to professionally videotape the entire ceremony. High Def Download $35; DVD-$45; BluRay-$55 plus $5 mailing charge for DVD/BluRay (no fee if pick up at TKA). The video will be ready June 8th. There is no live-streaming of the event. Orchid Leis for Graduates: After Spring Break, we will send out information for those who would like to order a lei for your graduate. Leis will be $20 and will be available for pickup in the Athletic Quad starting one hour before the graduation ceremony. Proceeds benefit TKA's Cross Country Team. Photos: Now & Forever Studios will take a photo of each student shaking hands with Head of School Meadows when receiving his or her diploma. Beginning Thursday, June 6, you may review the pictures and order prints online, and your order will be shipped to your home. Instructions on how to view and order photos here. Our staff members appreciate parents' efforts to make sure your student adheres to these guidelines. We are excited about this milestone event in your student's life and look forward to celebrating with you. Please contact me with any questions you might have.